NOTE: This year there is an extra weekend between Thanksgiving and Christmas. Folks that cut their tree early in the season will need to be extremely diligent in their care of it so it will last the entire Christmas season. If your tree was out of water for more than 15 minutes after you cut it, we recommend cutting another 1/2" off its base once you get it home and then immediately immersing it in water. We also recommend checking the water in your tree's stand daily and adding a preservative to the water to help increase needle retention. Finally, since Spruce trees are known to have poor needle retention, we strongly recommend waiting until the second weekend in December before you cut any Spruce tree. You might also consider trying a different Christmas tree this year. We grow firs, spruces, pines and cypress--below are descriptions of each tree we offer for sale and click here for our price list! Canaan Fir--Often called the "kissing cousin" of the Fraser Fir (which does not grow well in this part of Virginia), the Canaan Fir is quite similar to a balsam fir. 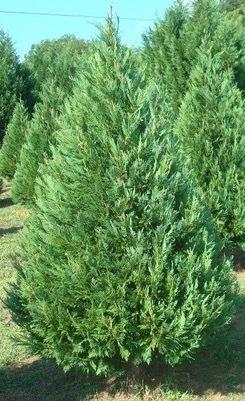 We have several fields of Canaan fir trees at various heights. The Canaan has strong, upturned branches making it great for holding even the heaviest of ornaments and it has a lovely fragrance similar to the balsam fir. Fraser Fir--Although we can't grow them because we lack the altitude, we recognize their popularity and so we head down to Floyd County, Virginia once or twice during the season to bring back freshly cut Fraser Fir trees. These trees are hand picked and are cut right before we bring them back to the farm, so you can be sure that they are as fresh as possible. Frasers sell very quickly, particularly the taller ones. If you know you want a tall Fraser Fir, call us and we'll put a 24-hour reserve on one. available in this part of VA.
Firs and sell them at our farm. Carolina Sapphire Cypress--Known primarily for it's lovely beautiful blue-gray color, soft branches and berries, the Carolina Sapphire Cypress also has an amazing scent. Like other cypress trees, heavier ornaments will not hang well from its branches and, once cut, this tree does dry out more quickly than others. We recommend not putting this tree in a stand for longer than four weeks! Leyland Cypress--This tree has soft branches, a great smell and, if watered properly, will easily last the entire season. While many in Central Virginia use this tree as a landscape and privacy tree, in the South, the Leyland Cypress is also a very popular Christmas tree. Allergy sufferers often prefer this tree as it does not produce any pollen--it is grown from clippings! White Pine--White Pine trees are one of the softest needle trees around. For decades this pine has been one of the most popular Christmas trees in Virginia. When space between the branches allows, larger and heavier ornaments may be placed towards the inside of the tree. The outside of the tree, however, has much more dainty and flimsy branches and they will not support any significant weight. A densely grown white pine may not allow for larger ornaments. The needles on White pines are approximately 3"-5" in length. Scotch Pine--Needle retention on a Scotch Pine is pretty amazing, even when it's dry! The needles are about 1" in length and the branches will hold light or heavy ornaments. There is little to no scent associated with a Scotch Pine. 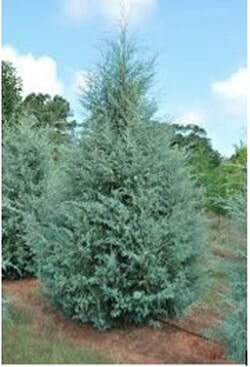 Blue Spruce--Easily identified by it's blue foliage, this tree has very strong needles that are about 1" long. The tree itself has a lovely symmetrical form and good needle retention. Branches will easily hold most any ornament. Most of our blue spruces will be available for cutting in 2018. Until then, a good alternative for those preferring this shade of tree, is the Carolina Sapphire Cypress. We will be selling some pre-cut Blue Spruce this year, however, they will likely sell quickly. If you are interested in one of these pre-cut trees, you may want to call ahead and put a 24-hour reserve on it. Norway Spruce--This tree has relatively short needles and firm branches making it, like other spruces, excellent at holding ornaments. On rare occasions this tree has been known to have needle retention issues--when that happens, every needle will fall off this tree seemingly at the same time. To date we've had this happen to one tree at our farm, but it can happen. White Spruce--This tree has short, firm needles that make it excellent for holding ornaments. Their color is a pretty blue-green but they have almost no scent. White Spruces are known for their good needle retention which is said to be better than with any other spruce tree. For years, White Spruces have been one of the most hearty and one of the most popular Christmas trees grown in Virginia.